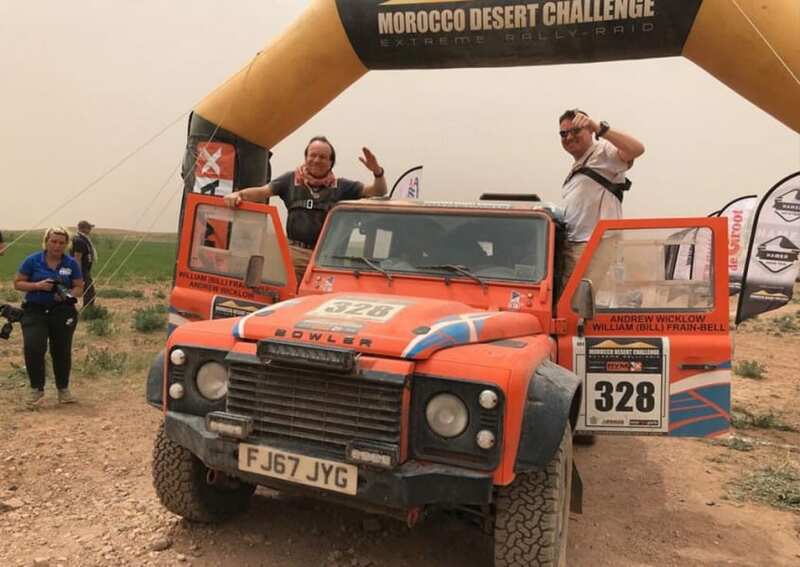 The Bowler team returned from the week-long Morocco Desert Challenge (MDC) extreme endurance event this week with all three of the Bowler Bulldog driver/navigator competitors achieving race finishes. Of the 63 cars that lined up at the start on the Atlantic coast in southern Morocco, 44 made it to the finish line 2,400km away on the northern Mediterranean coast, with the three Bowler Bulldog entrants finishing in a creditable 15th (Christian Femont / Peter Janssens; Belgium), 19th (Andrew Wicklow / Williams Frain-Bell: UK) and 30th (Bas van Driel / Prosper Voncken: Netherlands). The winner of the Bowler Cup sub-category and €5000 prize was Belgium’s Erik Loomans in a Wildcat, as the first placed Bowler vehicle but who finished the MDC 8th overall. The rolling format of the rally meant the vehicle service and bivouac camping areas changed location every day and, coupled with map-book navigation as opposed to GPS, fast tracks, technical sections, vast African plains, the famous Erg Chebbi sand dunes and salt lakes of the legendary Dakar stages, the conditions and environment posed physical, mental and logistical challenges as well as excitement, for vehicles, competitors and service teams. “I’ve taken part in two Tuareg rallies before supported by the Bowler Factory team, but the Morocco Desert Challenge is a very different event. It’s probably three times more challenging, and not just for me as a driver but also navigators and support crews, as the support crews are basically having to do the whole journey with you – just on the roads – and navigators are having to rely on their navigation skills and sometimes intuition, because this is a race based on a road book and not GPS. All that said, it also makes this race one which you really have a greater sense of ‘together’ as you’re all on the same journey – literally! “Another aspect that really struck me was that this truly is competition on an international scale. Knowing the UK’s love of motorsport and rallying I’d anticipated there would be more UK entrants – but Bill and I were it in the car class! We were the sum total and so felt additionally compelled to make sure we did well to represent our small island and do the UK justice. It was great to meet up and compare notes with other Bowler customers and Bulldog owners competing though from across the globe. “This real international arena also made my rallying experience feel like it was very much stepping up a gear, towards preparations for competing in the Dakar – hopefully next year – which was exciting. We were using international race spec in-car operating equipment and having exposure to that was awesome. It was all just another level up from previous rally experiences. “The length of the driving day was also something you can’t prepare for as such. It’s not that it’s 10 hours of driving some days, but the fact that you’re having to drive as fast and hard as you can for so many hours on the trot. I found that exciting as where else can you do that with no traffic getting in your way and such stunning scenery! You’re competing against your fellow competitors but also competing against yourself which again, is something that can be incredibly motivating and provide such a sense of achievement – if you’re that way inclined! “The whole scale of things is something to behold, as is starting on a stunning beach. The sense of lining up next to your fellow competitors, 60 abreast, on a beach in beautiful conditions and surroundings, and then going flat out at over 150km/h for 25km straight, on virgin sand with the Atlantic waves breaking all the way along, was a real highlight and experience never to forget. “Running alongside the competing trucks was another great experience. They are imposing bits of kit and to see one coming up behind you or similarly, to know you’re approaching a truck and are going to be able to overtake, gives you a buzz. Pushing the yellow sentinel button to give the signal you’re approaching and to ask them to move out of your way was like having something on missile lock and pressing the button. It’s an adrenaline rush to overtake one of the trucks. “The terrain was vast and varied but the Bulldog ate up the miles with ease which helped make the days seem not as long as they were. The car itself was comfy for that length of time and confidence inspiring as it felt planted, safe and robust so I had the confidence to push on. We had a few breakages and penalties along the way but that’s to be expected given the extreme terrain and manual navigation, and we lost count of how many mud flaps we went through. “My navigator, Bill, who is a good friend and lawyer by day, knew it would be tough but to some extent thought he was coming along for the ride as I’d be doing all the hard work by driving. Oh how wrong he was! “The night before the race we got the road book so needed to study that in detail as without the use of GPS, good navigation is critical for this race. Bill’s comment made us laugh when he said it was like receiving case notes only the night before the start of a big trial. Bill relished every second of the experience and a lot of this was down to the fact of his realisation and feeling that he was “integral to the outcome” and a key part of a triage team of car, car crew (as in driver and navigator) and the Bowler support team. We didn’t always get every mile of navigation right so ended up in a few odd places, but that only added to the overall enjoyment and experience. “Not being in contact with the team and having to deal with whatever is thrown whilst navigating your way through the stages means not just having focus and determination, but also a sense of humour and spirit of adventure. Again, not characteristics you would find yourself needing to deploy in an extreme situation in everyday life. “There were pre-organised lunch stops so we knew we’d see the Bowler support crew there – if we got there on time of course – but one day really sticks in my mind and it felt like we undertook this precision F1 pit stop! We had a small technical issue which meant we’d used double the fuel we should have by lunch time and only had 14 litres left in the tank. We didn’t know if we’d make it to the lunch stop and I was feeling inwardly gutted at that prospect, whilst trying to go as fast as I could but conserve fuel as best as possible at the same time, in order to get to the meeting point. It was like this magical moment filled the car when we could see the lunch stop in the horizon, and as we got closer spotted the Bowler Tatra, and then closer again could see the crew. A moment of complete joy. “There was literally only 15 minutes left of the lunch stop before the support crews had to get going on their way and what happened next was like watching poetry in motion. We pulled in and the Bowler crew undertook this seemless pit stop style tyre pressure reset, fix of the technical issue, refuel, full car safety check – and that’s it, we were back in the car and away again in under the 15 minutes. So impressive. “The evening bivouacs are another great element of rallying, but especially so on a rolling rally. The organisers put on an impressive hospitality and evening entertainment area with an authentic Moroccan themed and styled area. It’s an impressive show but what’s more impressive is that they are running until sometimes the early hours of the morning but then come breakfast the whole thing is packed down and they’re on the road, doing a similar amount of mileage to us and leapfrogging the country every day with the set up which is not small. When we get to the next stop it’s all fully up and running and ready waiting for us all. Those folks work incredibly hard to make the morning’s quick for competitors to eat and get on our way, and the evenings as relaxing or energy filled as people choose. There’s a really good vibe. “Driver crews turn in to their little one man tents around 10pm, dotted all around the service areas next to their team service truck, but the majority of support crews are often up into the early hours fixing and servicing the vehicles – drilling, welding, generators going all around you. Then there’s the test drives of trucks, motorbikes, quads etc going on to ensure everything is running perfectly. “It’s like camping in the middle of busy car garage operation. You just wouldn’t would you! But it actually makes you smile as the concept is daft when you think about it, but it’s perfectly normal on a rally and I actually don’t think anyone would have it another way. It would almost detract from what it’s all about. You certainly get to learn your engine notes of different vehicles quite well though and become good friends with ear plugs! “Rally racing is extraordinary in what it presents and creates and, with a car like the Bulldog and the support of such an experienced team like Bowler behind you, you feel ready to take on the world. If any one element is out of kilter – car, driver, navigator, equipment, support crew – the whole operation can fail; this truly is teamwork, camaraderie and racing strategy at its absolute best.